Off to the bank, a chore always, to find out what’s happened to the cheques I ordered…. I used to always wear a tie to the bank, today I am taking a different tack and braving the heat in a linen blazer, open collar twill tattersall shirt, sage linen trousers, herringbone socks and cream and olive saddle shoes. I hope that the service at the teller doesn’t reflect my more casual appearance. 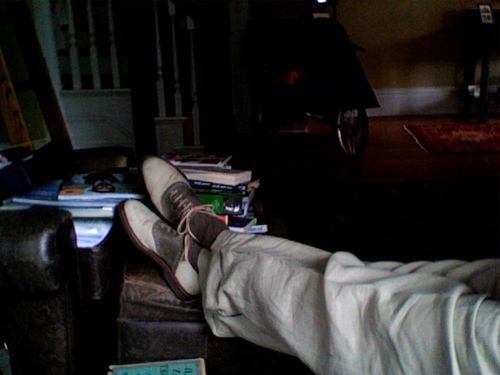 Then it’s off to the Home Depot to scope out RL shimmery paint colours for the front hall (When what I really should be doing is going through that pile of books and magazines on the club chair in the library…) Does anyone have experience with this sort of thing? I’m aiming for a pearlescent effect. Happy Friday and don’t forget tomorrow’s First Annual Easy and Elegant International Smartly Dressed Scene. 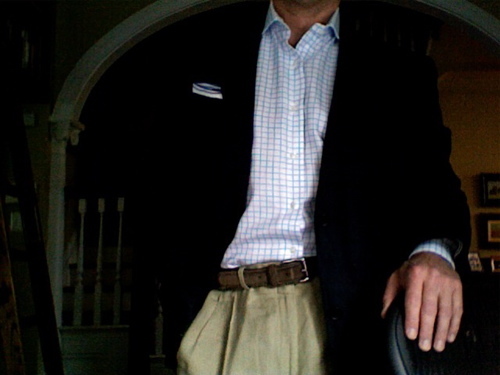 This entry was posted in Elegantology and tagged casual friday, Elegantology, summer. Bookmark the permalink. A friend just did her master bath in the silvery RL paint. I am headed over there and will try and remember to snap some pix. Ah, the home depot plethora of paint choices – no doubt you will find a pearl of a paint. There are some incredible silvery paints. They just make me want to lick the walls! You may want to do the ceiling silver and the walls a flat gray. I love matte and shine combined to look easy and elegant. Mrs. PvE, it is a frightening array. I chose a Prussian Blue to bring out a colour in the oriental rug and the Moorish pendent lamp. Then I will wash it with Candlelight finish… Your colour scheme sounds beautiful and I will use it somewhere. Behr makes a lovely opalescent finish. It can be found with their Venetian Plaster.